Seahawks.NET - The Voice of the 12th Man! • View topic - UPDATED Gameday chat. Please read AGAIN. UPDATED Gameday chat. Please read AGAIN. Since clicking on the CHAT button up in the toolbar has redirected you here, you can guess that this post is something that we want you all to read if you're going to participate in Seahawks.NET Gameday Chats. 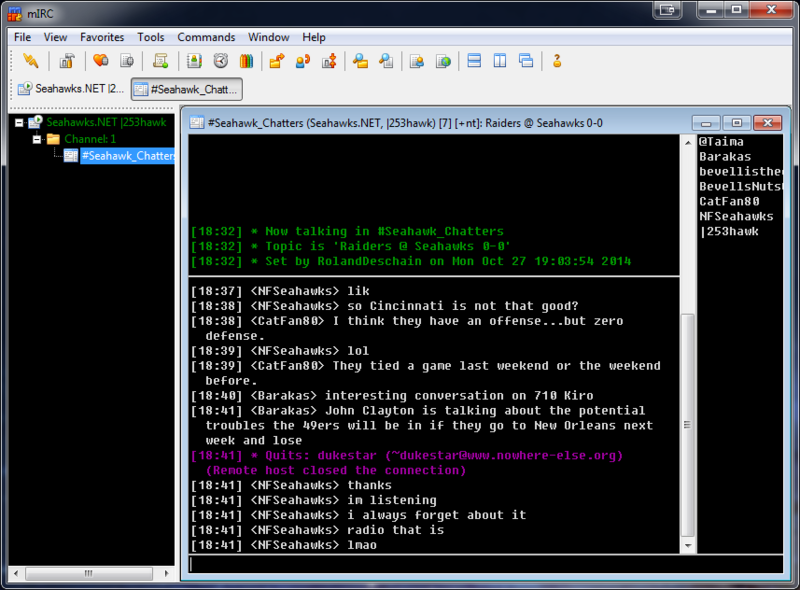 You are HIGHLY ENCOURAGED to use an actual IRC client if you want to participate in Gameday Chats. Although we used to provide a web based client for connection, we have found it to be too unstable of a platform to support, and therefore we have ceased offering a web based connection. IRC itself is a VERY old and robust technology. So long as the server is running, it will have almost zero problems accepting connections and processing chatrooms. Do yourself a favor, install one of the clients based upon whatever platform you're using. If you're having an issue with an actual client, we'll do what we can to help you get connected. There is a list of IRC clients, sorted by platform, a couple of posts below this one. 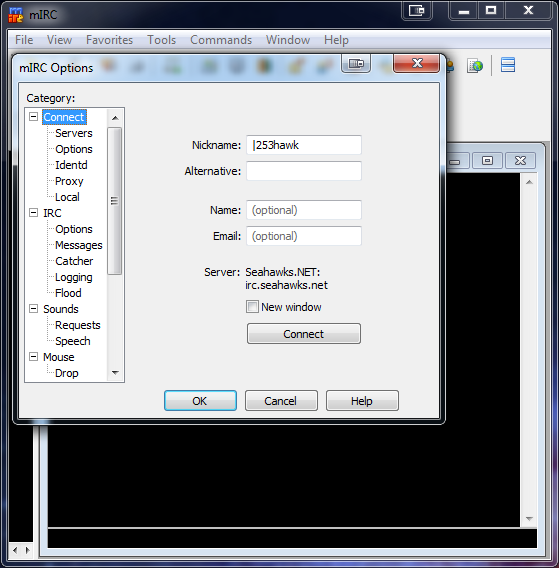 One other thing to note if you choose that you must connect using a web based client such as Kiwi/Mibbit/QWebIRC or any other; If someone has gotten a connection from those services (which are outside of our control) banned or KLINED from using our IRC servers, you will also not be able to connect using that service as they mask actual connection points, and the mask will be banned or KLINED. Want to drunkenly yell about the team on game day in real-time text? Now you can. We also talk about other games and celebrate in the glorious 49er meltdowns. It seems that a lot of people are having trouble getting into chat with the web client. There are several standalone applications (many of which are free) that you can download and use instead on your desktop or laptop. Phones and tablets have apps as well, but I don't have any experience with those. They are generally much simpler and more user-friendly though, due to their stripped-down features. All you really need for them are the IRC server (IRC.SEAHAWKS.NET) and channel name (#SEAHAWK_CHATTERS). First, you need an IRC (Internet Relay Chat) client. They are small but versatile applications which are usually only a few megabytes in size and are generally freeware or shareware. I prefer mIRC as I've been using it for about 20 years now, since the days of Windows 3.1. It's free for about a month and then has a nag feature which stalls the launch for about 10 seconds. I finally paid $10 for a registration, but you can use it for as long as you'd like or use another client. This setup will only cover mIRC, but it's generally the same for all clients and only requires a few simple steps. If you have another client and are having trouble setting it up, just ask in the thread and we can probably figure it out. After you've installed mIRC, you'll get this. Just type your nick into the the Nickname box and hit OK. If it's already been registered or is currently in use, the server will prompt you to enter another when/if you connect. You'll be at a blank screen with a command line at the bottom. 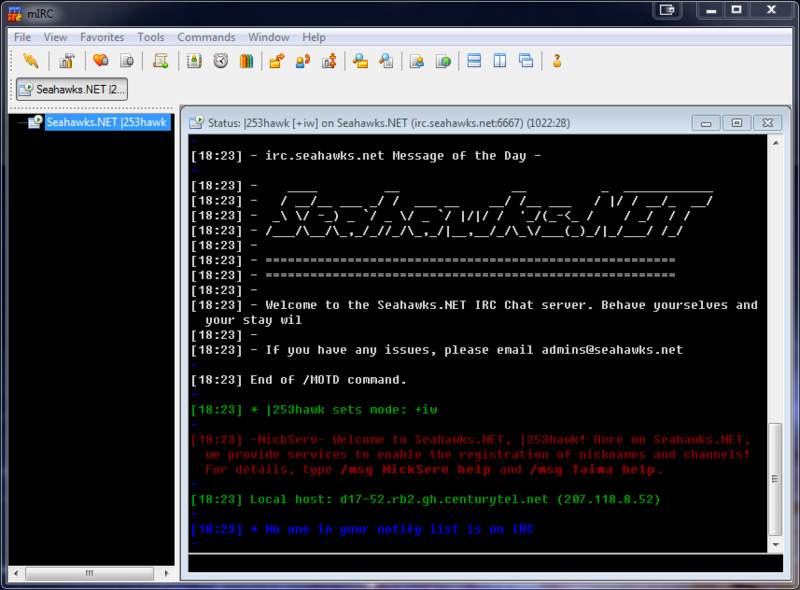 The server is irc.seahawks.net. So in the command line, type in /s irc.seahawks.net and hit enter, or click the lightning bolt icon in the upper left. You'll get a flood of connection gibberish and hopefully see the welcome message from the server. Now we're connected to the server, as you can see in the left window pane. You can be connected to dozens of servers and channels (chat rooms) simultaneously on each server. Many servers have a variety of channels/topics, but like Darrell Bevell, we're going to keep it one-dimensional here and just talk Hawks (since it's the only official channel on the server.) You can generally create any channel you'd like on a server and register it, if you'd like. From here, we need to get into a channel. So back in the command line box, we use the join command: /j #seahawk_chatters and hit enter. Boom. You should be in the den of iniquity. And that's pretty much it. Just use the command line box in the room to type as usual; hit enter to submit. You'll see a user list on the right (or you could if the page didn't cut off the pic) and two tabs on the top. 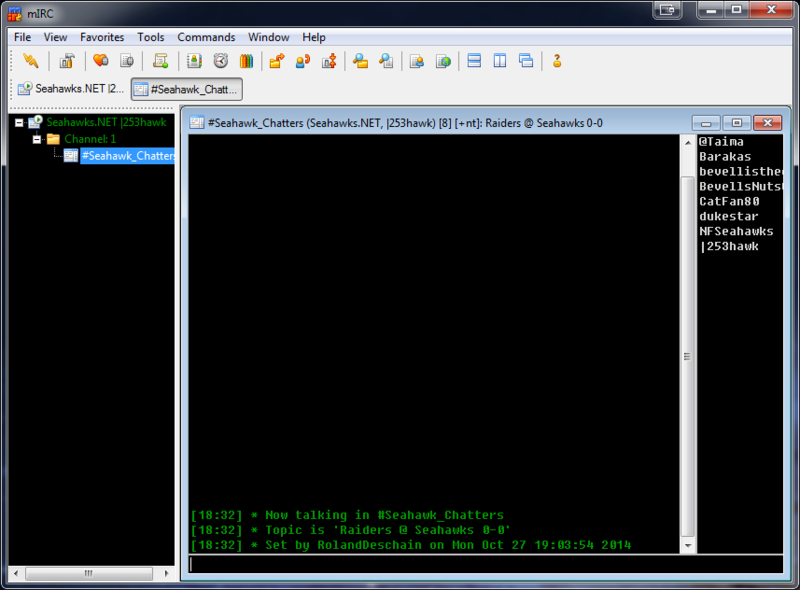 The left one is the server window and the right one is the channel window. You can minimize the server window as you won't really need it any more, except for maybe identifying your nickname or other sensitive operations. You can do everything from any window's command line, though. If you need help or have any questions about the plethora of features within the IRC clients such as how to register your nick, feel free to ask here or in the channel. Thank you for the helpful tutorial. Never got around to IRC clients, though I've always used a mail client. (Currently Thunderbird) I'll probably jump in and join for the KC game. For browser-only people, are there any Web-based IRC clients you suggest? Can someone do this but with android? olyfan63 wrote: Thank you for the helpful tutorial. Never got around to IRC clients, though I've always used a mail client. (Currently Thunderbird) I'll probably jump in and join for the KC game. We host a web-based client, but they are FAR less reliable, and it is subject to being load balanced out of usefulness. The forums and the load that they require will always take precedence, which is why everyone is being pushed toward using an actual IRC client for their platform of choice. sturg78 wrote: Can someone do this but with android? Here is a list of IRC Clients that I have tested and have confirmed work well. I've marked the client that I prefer in each category. Although complete configuration of each software on each device is different, following the basic guidelines posted by 253hawk as far as the server to connect to and the channel to enter should get you there. AndChat works pretty well. I have used it a bit. Have fun. Remember to use the same irc and chatroom. Also there is Turboirc which is an application on the kindlefire. I have not used it yet...so will learn that one too. Re: UPDATED Gameday chat. Please read. I've successfully connected and it works great. Yeah, if anyone else has had a good experience with an IRC client, feel free to share. All I really know is Windows/mIRC, so any Mac/tablet/phone info is more than welcome. I am on TurboIrc on my computer. One of the dudes said it is an application on my kindle...so I will work that when I get to where I can use my kindle. Re: UPDATED Gameday chat. Please read AGAIN. Hexchat works great. Use it every Sunday for the chat from my Linux Mint laptop. Since chat is perma-broken I used this and was able to visit with Taima on the Colloquy chat for a while. NFSeahawks628 wrote: Since chat is perma-broken I used this and was able to visit with Taima on the Colloquy chat for a while. I just meant that it goes down a lot. I'm not familiar with all the technological aspects of chat. Colloquy is weird, but it'll have to do. what happened to a game thread? RussWils3 wrote: what happened to a game thread? There is a game day forum, always has been. Kudos to the Eagles fan who showed up and took all of our good-natured ribbing in stride. Last edited by Anguish on Sat Jan 24, 2015 7:27 am, edited 2 times in total. Roland please explain this to me. I know my phone will support an IRC this time because I'm on 4G LTE but it's all Greek to me. MizzouHawkGal wrote: Roland please explain this to me. I know my phone will support an IRC this time because I'm on 4G LTE but it's all Greek to me. Geez, it's not like I check this thread. Send me a PM when you're ready for me to assist you in setting it up, lol. Did I see this correctly that you are to pay $20.00 to do this? When I click on the desktop shortcut after I download it it says I have to pay 20. For mIRC? It's free, it just nags you to register it after 30 days. You can continue to use it for free, it will just have like a 10 second nag screen when you launch it. I've been using it for 20 years, so I finally caved and paid $10 (there's a 50% discount code floating around). Got it. When I am on the screen asking for the "room" in which to chat, is it #seahawk_chatters? Yep. I forgot it pops up that one favorites window by default on connect (I disable it), you can just close it or enter #seahawk_chatters at the top. Remember that there are free IRC applications too. I use TurboIRC and it is a free download. Then enter in the site locations and 3 clicks and you are in. Click Turboirc, click connect when all the data is installed, and click #seahawk_chatters. 3 clicks. Go Hawks. I tried it. Didn't work for me. How did online chat rooms get so convoluted compared to how simple they were 15 years ago? Heck, we've used Chatzy just fine at Cougfan. Haven't used it this year though. I am using turbo irc and it works just fine. It is an app too on my kindle. easy stuff. Seahawks.NET uses IRC for its chat server. IRC has been the standard in multi user chat since 1988, and is the most stable and reliable platform to use. There are hundreds of clients available to connect to an IRC server, you just need to install one and configure it as been laid out in many different posts in this topic. Does anyone know where to watch the Seahawks game Sunday on the Northshore of oahu,? Bambalina wrote: Does anyone know where to watch the Seahawks game Sunday on the Northshore of oahu,?